The Iran Nuclear Deal: Is it good for the US? Video of The Iran Nuclear Deal: Is it good for the US? Watch or read Joe Cirincione's complete lecture on the Iran nuclear agreement, originally presented on January 29, 2018 at Oklahoma State University-Stillwater. In the video above, Joe Cirincione begins at 4:38. The following is the complete text of Joe Cirincione's lecture on the Iran nuclear agreement at Oklahoma State University-Stillwater on January 29, 2018. It has been edited for clarity. Thank you, it's a pleasure to be here. I thought what I’d do today is explain to you what the Iran deal is all about. So not necessarily the congressional politics of this or the clash of regional interests about this, but what it is the Iran deal is trying to do, and that is, basically, trying to stop Iran from building a bomb. So, I want to walk you through the Iranian capabilities, so you can understand: What does it mean that Iran can build a nuclear bomb, and how is it that we're trying to stop them from doing this? As was mentioned, the Iranian nuclear program actually began under the Shah. That's when the Shah started a plan to build about 20 nuclear reactors and secretly – we now know this – in the 70's, he started working on a nuclear bomb. All that was stopped when the Ayatollah took over in 1979, but after Iraq invaded Iran, the Ayatollah Khamenei reversed position and started up the nuclear program in secret, quietly as a way to counter Iraq's chemical weapons. Over the 80's and 90's, it developed in one center after another. Basically, the public face of it was to build this facility at Bushehr, which they've now completed. 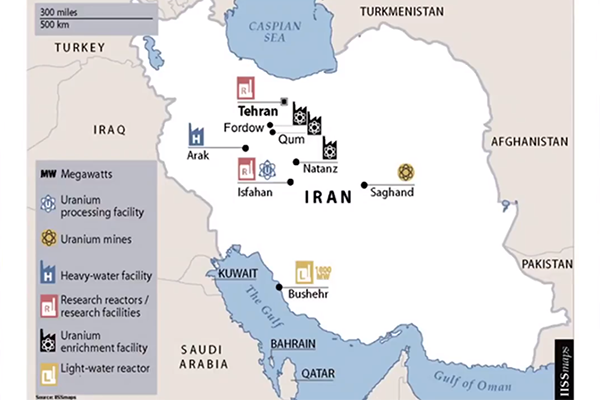 This is the only nuclear power reactor in the Middle East, and their version of this was in order to have this power reactor, which is the first of 20 they say they now want to build, they needed a complex that could create the nuclear fuel that could support the nuclear technology. So you can see they needed uranium mines, they needed uranium processing facilities, they needed research reactors, moderators for the research reactors, the thing that slows down the neutrons, they needed to build a heavy water plant and here, they needed to build enrichment facilities – at first secretly and then publicly. 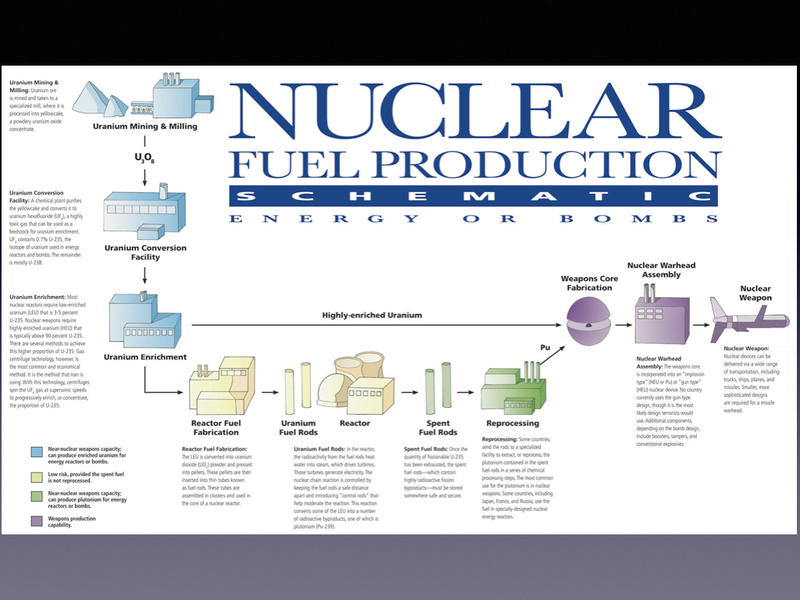 This is basically your nuclear fuel production cycle. The things in blue are the peaceful uses that are allowed by international treaties: mines, uranium conversion, uranium enrichment. 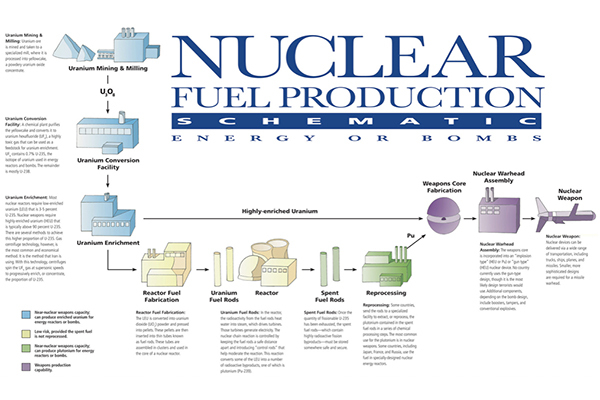 It then goes, the rest of the peaceful process goes here: making fuel, putting it in a reactor using it. Taking the spent fuel out, re-processing it. The trouble is that this whole cycle doesn't have to stay peaceful. It can go to weapons over here. 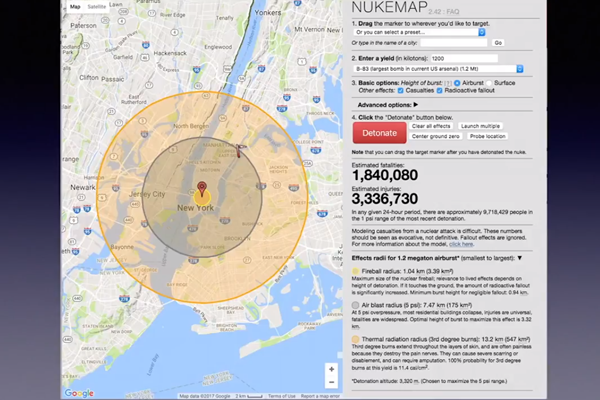 So, you can go from uranium enrichment, not to fuel, you can go straight to building a bomb. 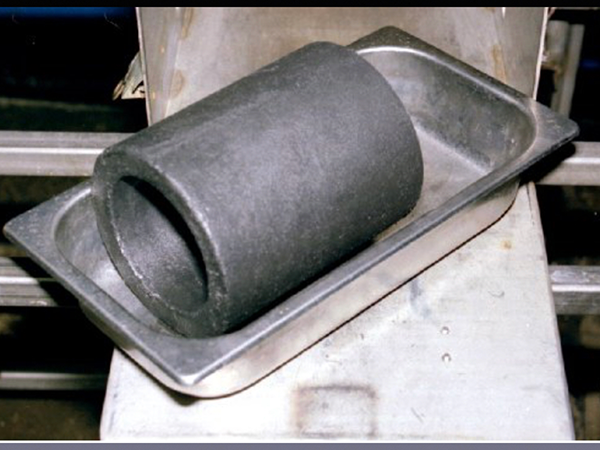 You can go from re-processing the spent fuel straight into making the plutonium for a bomb into assembly, into warheads. So which path was Iran really doing? The uranium path gives you uranium, which you can use to make a bomb because of nuclear fission. Our ability to split the atom. We knew we could do this in the 1930’s — the US was the first one to actually operationalize it. This is what led to the use of the creation of the nuclear bombs in Hiroshima and Nagasaki. I'm going to spend one minute on the physics of this — only because it's important to understand what the Iranians are trying to do. Nuclear fission is one of the most interesting things that happens in nature and it's an amazing achievement of humankind that we can split the basic element of matter. Uranium is the heaviest atom in nature. It's got 92 protons in it and about 146 neutrons. What that means is it's fairly unstable, and when you fire a neutron into the middle of a uranium atom, it splits into two other elements, barium and krypton, usually. But the interesting thing that happens is not the creation of these two other elements, it's what else comes out, and what else comes out is on average two other neutrons, and that means if this uranium atom is near another uranium atom, those two other neutrons will hit it, and those atoms will split. You see where this is going: one, two, four, eight. That's the chain reaction. Once you get it started, as long as the uranium atoms are close enough together, you split all these and you start a chain reaction that also results in that little squiggly line. Because what happens is when you weigh the other two atoms and the neutrons that have come up, it doesn't weigh as much as this original atom. A little tiny bit of the matter has been converted into energy. And when you plug that into Einstein's famous formula – the only formula we all know, E=MC2 – you realize that energy equals mass times the speed of light squared. Well, that is an enormous number, so a tiny little bit of matter produces an enormous amount of energy. You get about 200,000,000 times the amount of energy from a nuclear reaction that you would from a normal chemical reaction. The breaking and forming of electron bonds. The kinds of things you get from dynamite, for example. You get an enormous factor, so once we understood that, we understood we were on the verge of a powerful weapon and a powerful energy source. But it's tricky because not all uranium atoms are the same. 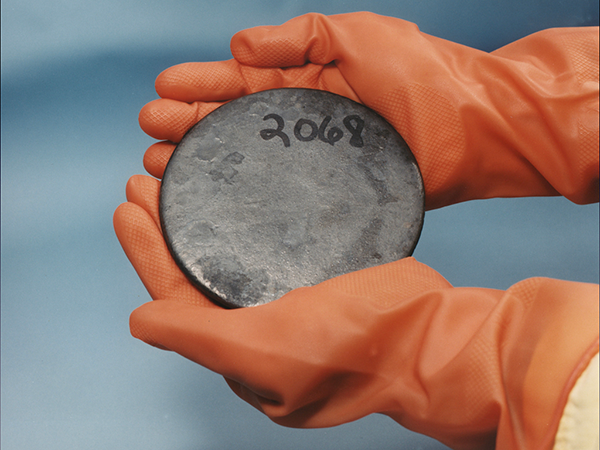 You need a particular isotope of uranium: uranium-235. Less than one percent of all uranium comes out of that, so you've got to purify the uranium so that you can get that particular atom and that's what the whole thing is all about. that's what all of this is trying to do. 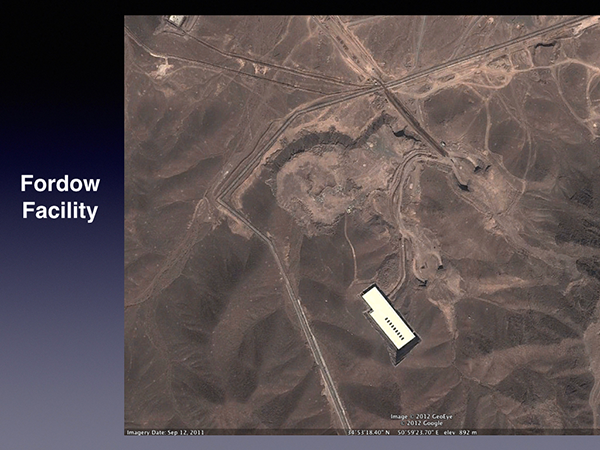 You start – and this is a uranium mine in Iran – you start with what you would find the uranium in to begin with. It's these little tiny flecks that you see. See, it looks kind of like granite. It turns out uranium is plentiful. 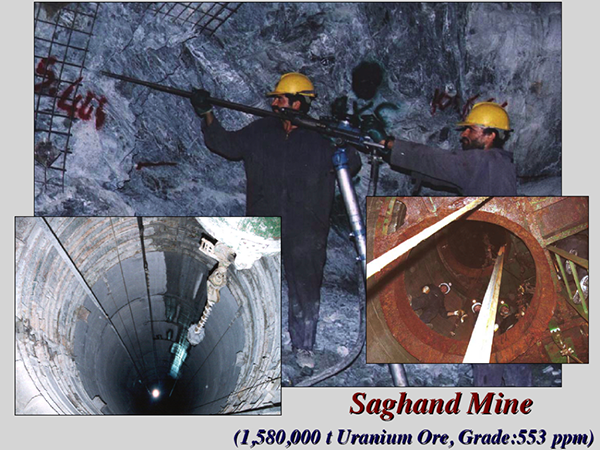 It's in many places in the world, including in significant quantities in Iran, so this is one of their main mine facilities. 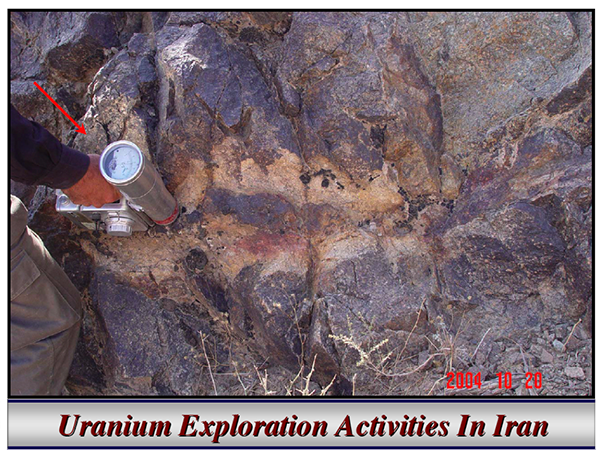 Pure uranium usually looks like, like you could bake a cake out of it. It looks like yellow cake, and that that's where that phrase comes from. it's a powdery substance that’s then used to…you use it, you have this uranium nitrate, they call it, and that's what you can transport, leaving all the rubble, the rocks behind. 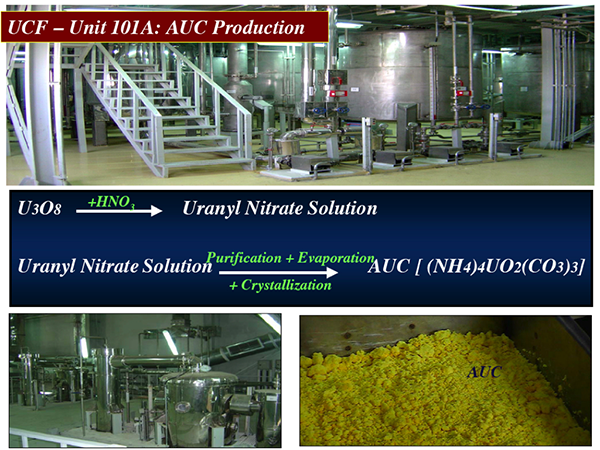 The next step of this process is to take that uranium yellow cake and turn it into a gas. And so, you combine it with fluoride to something called uranium hexafluoride, UF6. You have a very toxic, very difficult to use gas, but you have to combine it in this in order to turn it into, into use it into centrifuges. 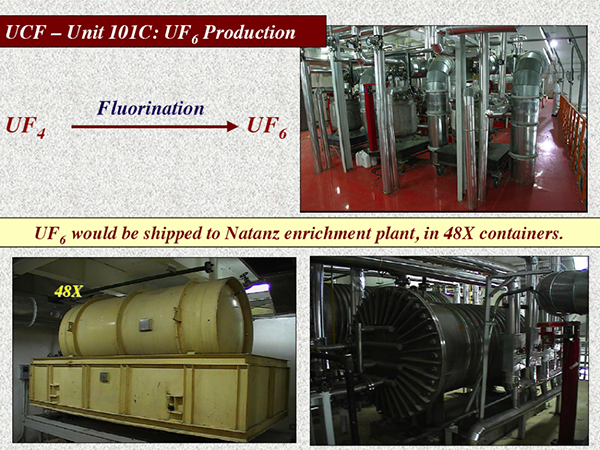 This is the centrifuge plant at Natanz that Iran secretly built back in 2000, 2001, and 2003. We publicly revealed it in 2003 and that's what precipitated the crisis. Iran is allowed to do this, but they had to declare it. They didn't declare it, and that put them in violation of their treaty obligations, their obligations under the Nuclear Nonproliferation Treaty. 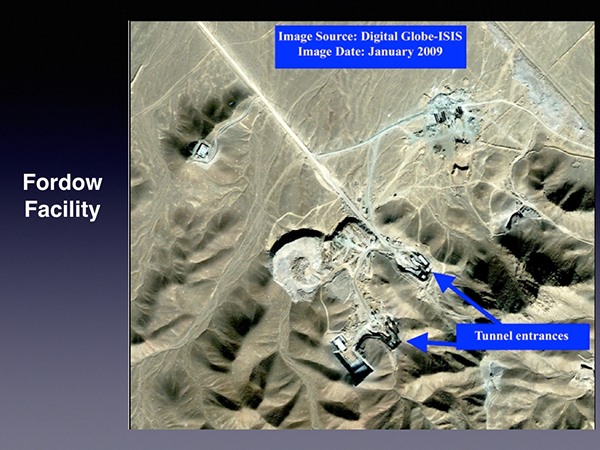 Once this was discovered – they were in violation – you can see it's a large facility, this was photographed before they buried it. Everything got buried in order to protect it from bombing attacks – they did the same thing in 2008 after we discovered the original facility. They thought they could get away with it again. Iran has a history of cheating on its agreements and we have a history of catching them. 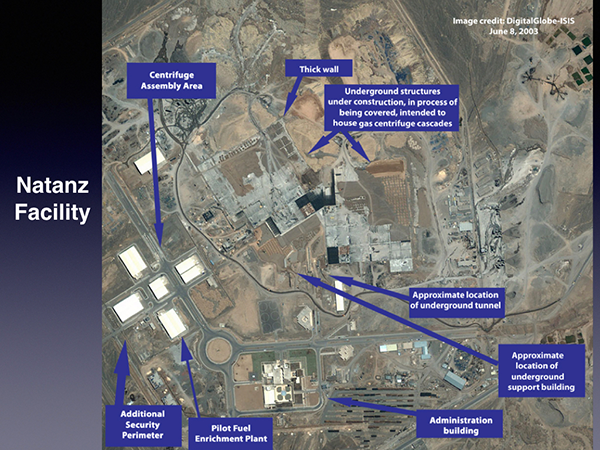 This is the Fordow facility, also an underground facility, which we revealed in 2009, the first year of the Obama administration. This is while it was under construction, and this is when it's finished, all covered up – a deeper underground facility. So deep, in fact, that very few of our weapons or the Israeli weapons could hit it, and that was the purpose. That's why they were doing it, to stop them from having a bombing attack. What's inside these facilities? This is where the story gets a little interesting. These are centrifuges. 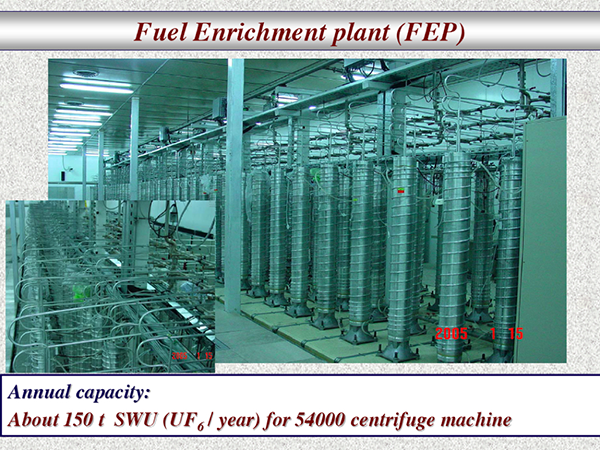 These are actual Iranian centrifuges. They're about the size of water heaters, they're made of very high-tech materials, the walls have to be thin but very strong, they have to be able to withstand tremendous pressure because inside those centrifuges, they're taking that uranium gas that uranium hexafluoride and they're pumping it into the centrifuges. And then they're spinning it around at supersonic speeds building up tremendous pressure in the centrifuges. And for any of you who remember anything from chemical or biology classes, chemistry classes, biology classes, you remember that in a centrifuge, the heavier elements go to the outside. So, most of uranium is made up of the isotope U-238, so the U-238 atoms go to the outside. Inside, the lighter 235 tends to concentrate, and you take that interior gas and you pump it out of the centrifuge and now you have a gas that slightly increases the ratio of 235 atoms. It's slightly enriched with 235 than what you find naturally. But not much, so you have to do it again and again and again, and that's why you have to have these uranium centrifuge cascades. You've got to do this over and over and over again for months with tens of thousands of centrifuges and if you do that, you could stop the process when you have about three percent enriched uranium, four percent enriched uranium. 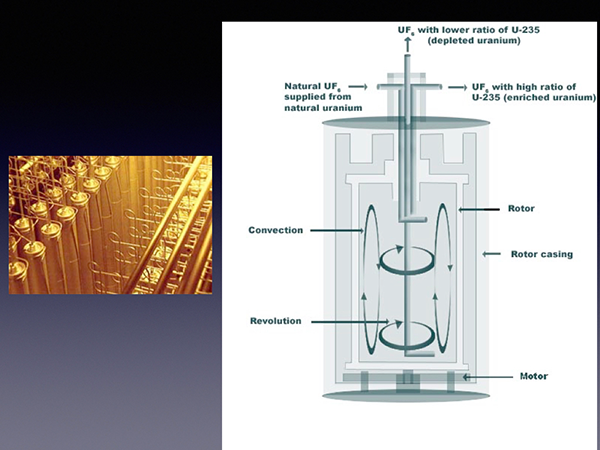 You can take the uranium out convert it into a powder form, put the powder into little pellets, put the pellets into fuel rods, put the fuel rods into these fuel assemblies, and stick the fuel assembly into a nuclear reactor, and then have a controlled fusion reaction. The atom starts splitting, but at a slow controlled rate. That energy is emitted in the form of heat, the heat turns water into steam, the steam turns the turbines, and that gives you electricity. 20 percent of electricity in the United States is produced in exactly that way. 20 percent of electricity comes from the one hundred or so nuclear reactors we have. The heat of the reaction drives the turbines, and "that's all we want to do," said the Iranians. "That's all we want to do." They were assembling centrifuges very very rapidly. 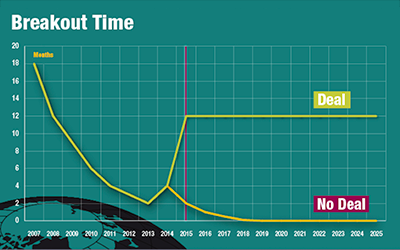 And this was the chart you can see climbing over the years starting in 2003 when we first discovered Natanz, and they kept putting more and more reactors, nuclear reactors in, nuclear centrifuges in. But they didn’t have to do this. Most countries that have reactors don't make their own fuel because it's very expensive. You only start making your own fuel when you have maybe 15 reactors, 20 reactors. they didn't even have one and they were putting all these centrifuges in. that's part of the thing that made us suspicious, that this was just a cover, that what they really wanted to do with the centrifuges to turn it into a nuclear weapon and this is a little technical so I'm going to go over it real briefly. It turns out that most of the energy needed to turn those centrifuges, to enrich the uranium, most of the energy takes place very early on when you're enriching at this level for power reactor grade four to five percent. Here's the energy that it takes. Once you get to four, five percent, it doesn't take that much more energy to go up to 20 percent, which is the type of fuel that’s used in some other research reactors, and then from there it doesn't take much at all to get it up to 90 percent. So, 90 percent pure 235: that's bomb material. So, what you're worried about is that Iran is building up the capability right here to have a massive ability to produce this kind of uranium and then it can quickly sprint to a bomb. So, the whole issue was to stop them from doing that. How do you stop them from doing that, because here is – remember this chart? Here they are, they've completed all these in blue. They've got the mining, they have uranium conversion facility, they have the uranium enrichment facility, which way are they going? They say they're just going peaceful, but they could sprint right to the bomb. Here's what it looks like when you take that uranium – and that's 90 percent uranium – and you don't convert it into a powder, you convert it into a metal. And then you fashion this metal into a slug, like this. And this, you can put in a primitive fission bomb. 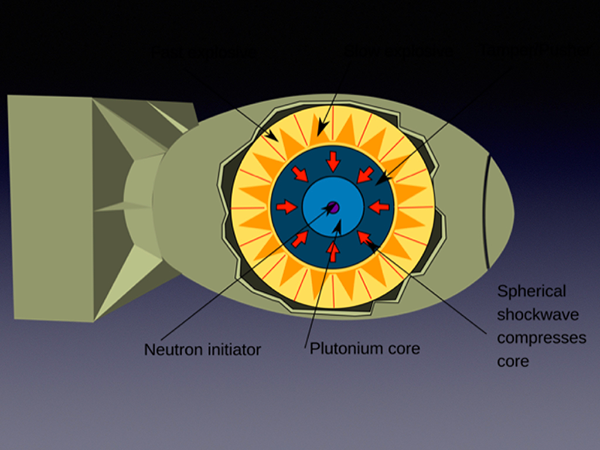 This is the design for the Hiroshima bomb. You see there's a slug, a cylinder target at one end and a hollow uranium bullet at the other end. 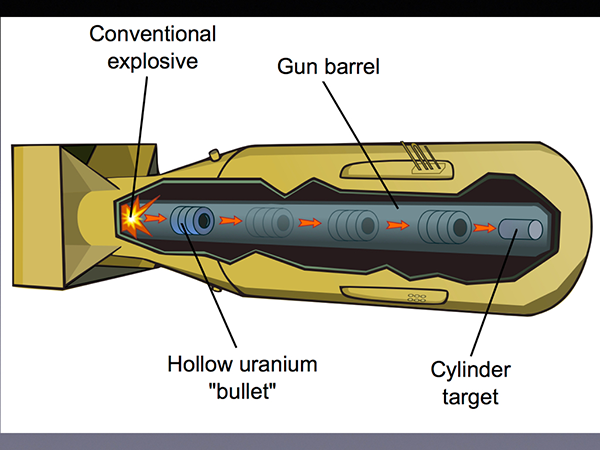 It’s basically a gun, and you fire that hollow uranium bullet as rapidly as you can towards a cylinder target, and when it hits that cylinder target, you then have critical mass. At that point, at 90 percent enriched uranium, that's when the fission reaction takes place and it is not controlled. It is not controlled at all. The energy is released suddenly and violently into a nuclear explosion. Now there's another way you can build a bomb, and it turns out the Iranians were working on that too and this goes back to…that 238, which is not useful for building a bomb, in the process of undergoing fission in a nuclear reactor some of that uranium-238 is turned into...and I'll skip over all this, but it undergoes better decay and it turns into another element. Instead of having one of the neutrons in the nucleus turns into a proton, and now you have something with 93 protons which the scientists named after the next planet in the scale, uranium is named after Uranus, neptunium which then decays very quickly into another element which they named after the final planet, no longer a planet, plutonium. Pluto. Plutonium is even more fissile then uranium. It takes less plutonium to make an explosion, about that much. About the size of a small grapefruit, a large peach. Not that much at all. You can put this inside a metal core, and you can put this inside a bomb. 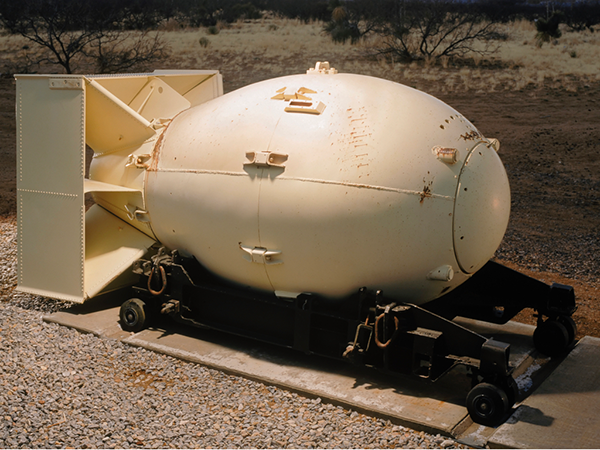 This was how we built the Nagasaki bomb, this was the bomb we tested at Trinity. 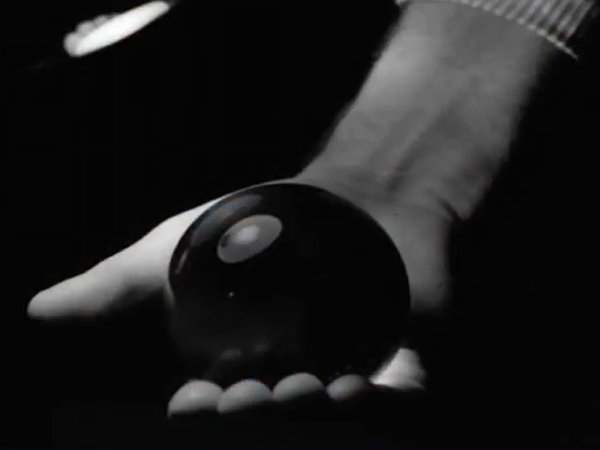 It's basically a chunk of uranium, a hollow ball of plutonium surrounded by carefully designed explosives that would all go off if they all go off at exactly the same microsecond, will all focus the explosive energy into the hollow sphere, crunch it down into critical mass. It's basically turning a basketball into a baseball through explosives. And when you get that critical mass, that's when the chain reaction starts and releases an explosion. This is Fat Man. this is the Nagasaki bomb, that's what's inside, that's why it looks like that. 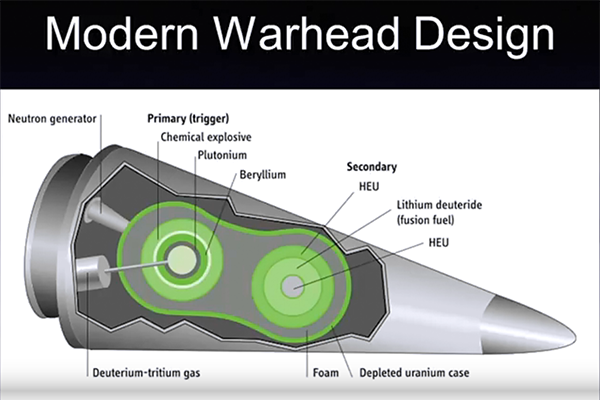 Most of the countries that build nuclear weapons right now use this design. You can do it with uranium too, but you can make them smaller with plutonium. In fact, the United States, and Russia, and Great Britain, and France, and China, and Israel – probably Israel not clear – have gone on to the next stage and gone way past atomic bombs – Hiroshima, Nagasaki size – to hydrogen bombs, where we use an atomic bomb to fuse hydrogen fuel, and releasing even more energy than is released by fission reaction but we'll skip that part. We don't have to worry about that because with Iran, we’re just talking about the basic fission bomb, which is bad enough. How bad? Let's say we dropped a 20-kiloton bomb. 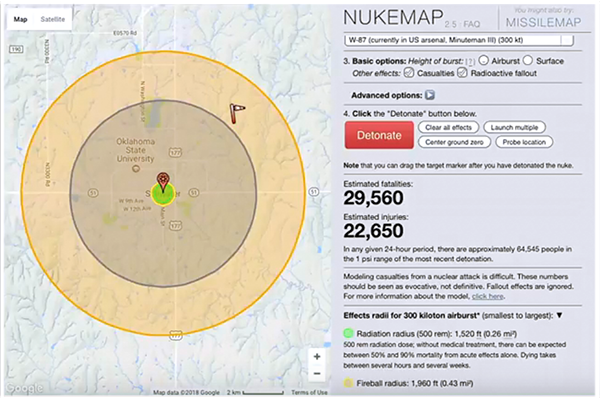 This is the Nagasaki bomb on Stillwater, for example. So, let's put this in scale. I was just – as I drove by – I drove by Oklahoma City, the federal building, and looked at the bomb that destroyed that federal building, killing 168 people. You saw that, that was two tons of explosives. So that's two tons. This is 20,000 tons, OK? So, it's 10,000 times more powerful than that two-ton explosion. It's one bomb, comes from one plane or one truck, and if it’s set off here, you can see the fireball takes all of Stillwater. The blast effects, the blast effects hit Oklahoma State University. All the glass would be broken, everything would be shattered in this. The blue circle represents all the buildings that would be flattened. The more yellow or light orange circles are all the ones that undergo heavy damage. Casualty figures…it turns out you're pretty sparsely populated here, be about 13,700 killed plus another 16,000 injuries depending on time of day. So, this is from one bomb, one place, that's the kind of destruction you could expect from this kind of weapon. 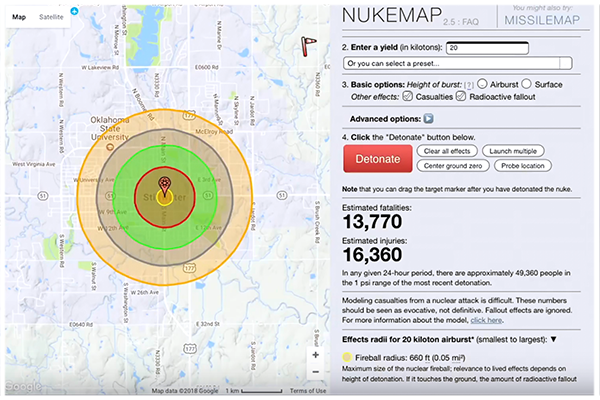 If you went to a thermonuclear bomb, a larger bomb, 300 kilotons, you can see the blast radius increases dramatically. These are the kinds of weapons we have in our arsenal, but even the 20-kiloton bomb is bad enough. You put it on New York City, a hydrogen bomb, you can see the kind of destructive radius you get. So, this is what worries everybody. The deal that was negotiated with the Iranians blocks their paths to a bomb. That was the whole point of it. They had to rip out two-thirds of their centrifuges. So instead of having 20,000 centrifuges – you saw the arrows going up – they went down to 5,000 operating centrifuges. 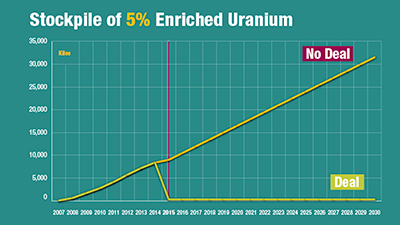 They had to take all the uranium gas that they had been enriching to 3 percent, 4 percent and storing, they had to ship it out of the country. So, all they have left is a token amount. They had a reactor, there was a research reactor that would have been capable of producing enough plutonium for one or two bombs a year, they had to pull out the core of that reactor, drill it full of holes and fill it with cement. So, this is what happened. We blocked the Natanz facility, incapable of making the amount of material for a bomb. We blocked the Fordow facility, incapable of making material for a bomb. This isn't a matter of trust, this isn't “they promised not to do this.” No, we ripped out their capability for doing this. Weapons-grade plutonium: blocked, can't do it. Covert attempts: blocked by the inspection regime. 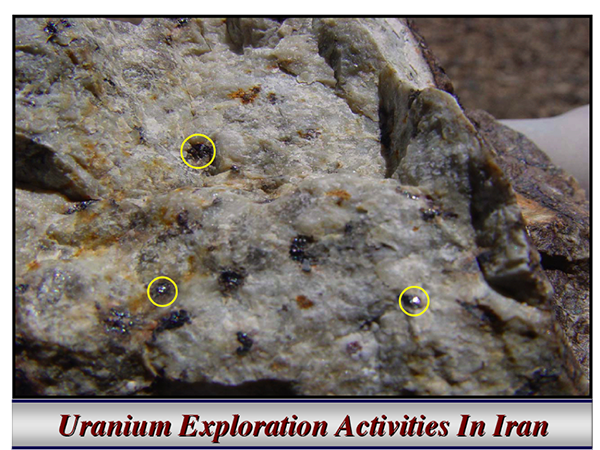 We track every gram of uranium that is produced in Iran now. This is unprecedented. We have inspectors at their minds that watch it while it's being mined and follow it all the way through the production process until it’s in its finished form. If there's a discrepancy, if we're getting less at the end, then we got to see at the beginning, you know something's wrong. Plus, inspectors at all the uranium facilities, plus cameras, plus seals – and I don't mean Game of Thrones whacked seals on parchment – I mean fiber optic radio frequency seals. So, if they break one of the seals, the headquarters of the IAEA, International Atomic Energy Agency in Vienna, knows it immediately. So that's what we did here. It would have been so much easier if we'd been able to do what many people wanted us to do and just eliminate the nuclear program altogether. Get rid of all the centrifuges, get rid of every facility, get rid of the reactor at Bushehr, get rid of it all. But we're not Rome, and Iran is not Carthage. You couldn't do this. You couldn't scrape the Earth and solve it. We had a deal, we had a compromise, and the compromise is to roll them back far enough and put limits on them for 15 years, in some cases, 25 years in the other, and for some, the ban on ever making a nuclear weapon, that's like a diamond. It lasts forever. The inspection regime? Like a diamond, it lasts forever. So, you had this compromise and those compromises are what is so controversial today because the people who wanted the scraped Earth deal are still angry, and still want it, and still raise questions about it. But when you look at what we did and you look at where we’d be without the deal, this is why the title of this talk is called ‘Why the Iran Deal in the US National Interest.’ This is a major achievement for US national security. 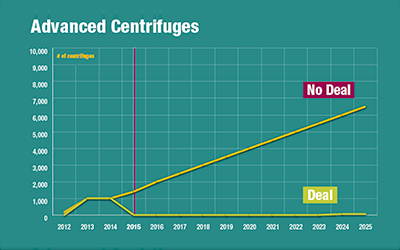 Here's where we would have been without a deal: centrifuges going to increasingly – numbers of centrifuges getting up to by 2020, you've got about 36,000 centrifuges. Man, that is enough to make enough highly enriched uranium for a bomb in a matter of weeks. 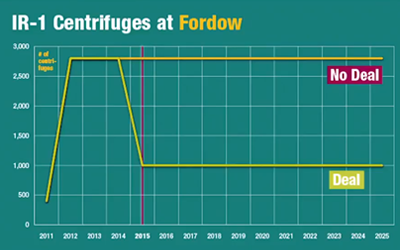 The centrifuges at Fordow. It was a small facility, they were going to cap them at 3,000. We bring them down to 1,000. These are slightly more advanced centrifuges at Fordow. Remember, that's the deeply underground, the deeply buried underground facility, harder for us to hit. We kept them down here, where they can't do much of anything. They can't make enough material and their stockpile of enriched material. You know, even with a small number of centrifuges, if you keep doing it, eventually you'd have enough of a stockpile, but the stockpile is capped. They can't have more. They can’t have more than 130 kilograms of gas stored, and without it they would have gone up and up and up. Advanced centrifuges. Basically, this is the bottom line. The breakout time, how much time would it take them to build a bomb if they'd wanted to. Without the deal, it would have gone down to basically weeks, days, before they could break out from a standing stop and build enough material for bomb. With the deal, we extended out to at least a year warning time. And that continues until about…well we've got about 13 more years before that that starts to wane, before they're allowed to start building more centrifuges. I've talked for over thirty minutes, let me sum up here and then open it up for any questions that you have. 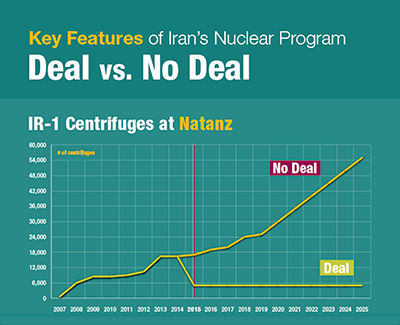 This is why so many nuclear policy experts endorse this deal. This is why so many military experts endorse this deal. This is why the national security team for President Trump say, “keep the deal.” Secretary Mattis, Secretary Tillerson, McMaster, the Joint Chiefs of Staff, the joint chiefs themselves, the intelligence agencies are telling the president of the United States to keep the deal. Why? Because it works. It works. It's in the US national interest to have stopped Iran from building a bomb and to have a deal that will continue for at least 15 more years. What happens then? Do some of these provisions end? Yes, they do. This is part of the deal, like many deals, it doesn't last forever. There’s a sunset, as they say, so what happens at the end of that time, that's for us to help decide. A lot depends on what we do with Iran between now and then. What kind of negotiations do we have with Iran between now and then? What kind of conflict resolution pursuits do we undertake in the Middle East? 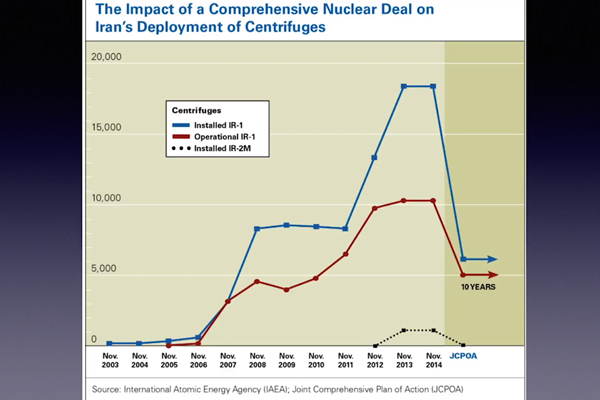 What kind of incentives do we give Iran for not pursuing this path, for not accelerating the number of centrifuges? What kind of disincentives do we give Iran? How do we warn them that if they return to this path that they were on before 2014, that there will be grave consequences for doing that? That's what diplomacy is about, that's what National Security Strategy is about. Is this deal perfect? No, but it is damn good. It is by far the strongest nonproliferation agreement I've ever seen. It does a remarkable job, and it was done with the cooperation of dozens of organizations, not just the Europeans and the Russians and the Chinese – the so-called P5+1 – but this is a UN Security Council agreement. This is not a bilateral agreement between the US and Iran. This is not something where the president sat down with the leader of Iran and signed a paper in exchange. This was done at the UN Security Council. So, the international community is vested in this, is vested in this deal, and it's very very hard to find any nation in the world who thinks we should break this deal. Even in Israel, where their leader Mr. Netanyahu is probably the most outspoken critic in the world of this deal, his military and intelligence apparatus tell him to keep the deal. That this has removed Iran as an existential threat to Israel. When the command staff of the Israeli Defense Forces listed their top 10 threats to Israel, Iran isn't on it anymore. They're much more concerned about events in Syria, about Hezbollah, about what's happening in the conflict with the Palestinians, but Iran is not presented to them. 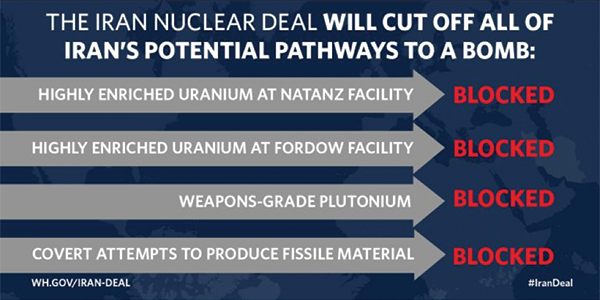 They don't see Iran as a major threat, in large part because of this deal. So that's why I think it's in US national security interest to keep this deal, to build on this deal, and to strengthen this deal. Let me stop there and open up for any questions or discussions you might have.